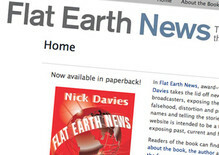 Flat Earth News, the book by the investigative journalist, Nick Davies, that attacks the current state of British media, has won the first Bristol Festival of Ideas Book Prize. Davies was last night awarded the £10,000 prize for his account of journalism in the UK, which the judges said 'raises important issues'. "The book makes you question the information that you get from the media. It is a challenge to complacency and a worthy winner of our first award," Andrew Kelly, director of the Bristol Festival of Ideas and chair of the judging panel, said in a release. Davies, also quoted in the release, said he was inspired to write the book when he realised the inaccuracy of reporting on weapons of mass destruction in the Iraq war; and furthermore, the failure of the news organisations to acknowledge their own role in events. His book, Davies said, 'describes the numerous subtle ways in which, during the 'good years' when news organisations were highly profitable, the logic of commercialism invaded our newsrooms and usurped the logic of journalism'. "That process has accelerated alarmingly with the arrival of the credit crisis, which has intensified all of the financial pressures which have been responsible for the decline in the quality of our news," he said. Issues raised by the book are being discussed by the House of Commons Culture, Media and Sport select committee as part of their inquiry into UK privacy, libel law and press standards. Davies told the committee at the end of April that what he is 'really writing about' in the book 'is the way in which commercialism has invaded our newsrooms and undermined the values of journalism'. "There are all sorts of aspects to that; the impact is subtle and manifold. The big, obvious structural impact is what is being called churnalism, which is essentially that the big corporations have cut their costs by reducing the number of journalists but increased their output because the more pages you print, the more advertising you carry and therefore the more money you can earn. The impact of that is that journalists just do not have enough time to do their job," he told the committee. In a subsequent hearing, the editor of the Daily Mail, Paul Dacre, said that his title was not guilty of the charge of 'churnalism', despite criticisms made against the newspaper in Davies' book. "Our spending on journalism today is as great as ever, despite the recession, so I think Mr Davies makes a valid point about some areas of the media. I think the strong areas of the media, and I include some of our very worthy competitors, are not guilty of this [churnalism] charge," Dacre told the committee. "His book does not do himself or our industry justice. Parts of it are a mish-mash of innuendo, gossip, smear and half-truths masquerading as truths, the very thing he accuses newspapers of indulging in. It was written without affording the basic journalistic courtesy of checking his allegations with the newspapers concerned (...) nor did he allow us to put our answers to his allegations. I regret all that."